The only surface eater came to my micro-caddis. 11' rod, 30' leader, and a yarn indicator. Don't mind the reel. I joined a couple of friends at a Forest Service cabin on the uniquely named Rock Creek last week. It was a wonderful time. Andrew is an experienced backcountry fisherman/guide, but his brother was here from Georgia and had never experienced mountains or fly fishing before. The fishing last week was perfect for all of us. Plenty of fish and plenty of challenges, too. We used a variety of nymphing setups from the Montana classic 6wt and a bobber (effective but boring), to Euro-style nymphing on a 3wt (tenkara with a reel), to a couple long seiryu rods (maybe too exciting when you catch a big fish in current). All worked well, and it was nice to be able to fish with whatever sounded most enjoyable at the time. The long rod with light line technique, with or without reel, was critical for effectively fishing a few of the more technical areas. 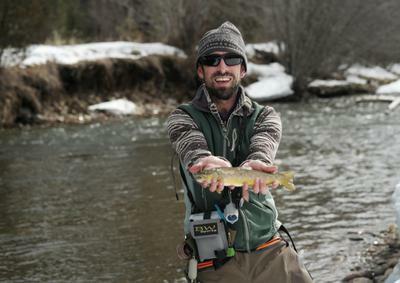 The more memorable events started with Robbie's first fish, where he doubled up on his first day of fly fishing. Andrew caught a couple little Bulls on small nymphs. I hooked up with a nice cutthroat that turned broadside into a fast channel and ran Andrew (my net caddy at the time) and me well over 100yds through deep snow and brush before netting. And we ate some amazing steaks cooked on the wood stove. Lots of smiles to go around. F-flies (smaller the better) and cloudy days are getting the job done in the Hills. Careful what you wish for Hoppy D! If I spent all my time fishing you wouldn't have the good stuff to fish with. Oh still thy selves, my flopping lips! More fishing equals less goodies? Not a good thing! Toil on!! Phillip - It is always nice to get away with friends for a week! No phone and time on the river can't be beat. You sure have seemed to have bonded with the Sagiri! It looks like you caught some nice fish. Had a great time to boot! I'm off next week and will have some fishing fun too. Hoppy D - Don't encourage Chris to go fishing I am not sure I am done buying things! Interesting you buy a Montana licence, I almost always get an Oregon licence and sometimes a Nevada one as well. Maybe I should just learn to stay home. Les -- I don't know what encouraged me to urge Chris to leave his one-man sweat shop and head for the water. Must've been the smell of springtime on the breeze; that always makes me do crazy things. That little caddis I used was similar to an F-fly. Size 18, mole body, and a gray dun CdC wing tied forward then folded back. Simple and effective. There were tiny black stoneflies crawling to shore and mating. I figured this was a fairly close match. We didn't have phone service, but that didn't stop my friends from communicating. We had a 60m dipole strung up between trees and took advantage of the lack of interference to chat with some people on the east coast of Canada. An interesting camp activity. The Sagiri is simply the most effective fishing tool I've used. I haven't demoed any other long rods, so I can't compare there, but the Sagiri simply works like an extension of my body. When nymphing especially, the Sagiri is both the most effective tool *and* the most fun. A 6wt with a bobber and a bunch of lead gets the job done, but you have no control over the flies which is boring, and the casting is awful. It's a bit different when it comes to dry flies. I'd say that 90% of the time getting close with the Sagiri is going to work better. I can easily drop the fly right at the fish's nose with no disturbance of the water. This isn't always the most fun, however. I really like using the 4wt I built with amboyna burl handle and scarlet silk wraps, and there's something about laying a perfect cast across the water despite complex currents that's really satisfying. Not a good way to catch a lot of fish, but satisfying. Hoppy, if either you or Les make it out to SW Montana I'd love to get out on the river. I've never fished with another experienced tenkara fisherman. It would be cool to compare notes and techniques. Hoppy D - In reality, I think Chris needs to get out there and test more of the great equipment he is offering us. So, Chris I am hoping to see a fishing report from you soon. There are two reasons I buy an Oregon fishing license. 1. The tailwater section of the Owhyee River which is one of the finest tailrace brown trout steams in the West is only 40 miles from my house. I can also fish the North Fork of the Owyhee without worrying about where the border is. 2. 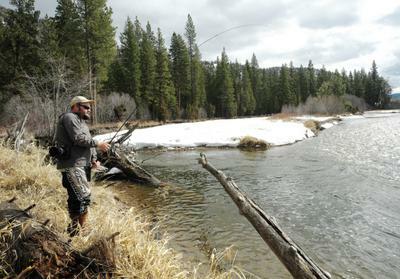 I lived in Oregon for 35 years and I know more places to fish there than here (Idaho). I now live very close to a small mountain steam in Oregon I first fished in the 1980's. It is closer than most of the mountain streams from where I live in Idaho. The trout aren't big, but they are wild, and the most beautiful rainbow trout I have ever seen. I'll get some pictures this summer and post. It is a perfect Tenkara stream. I just checked and the only tailrace fishery that wasn't dumping water just doubled their discharge. My week off for spring fishing next week may be restricted to pond fishing. The Salmon is blowing out due to run off so no steelhead fishing till next month! Phillip -- Sounds like you might have had a Fall trapline out for moles! I'm using vole fur over here, dubbed on as fine as a mother-in-law's moustache. As the saying goes..... Ha! Les -- The draw that MT has for us is that it reminds us of Alaska. Just needs a few more glaciers, more permanent snow packs, and salmon runs up the Yellowstone..... Ha! As we tell everyone, we are not from SD; we're displaced Alaskans living in SD. 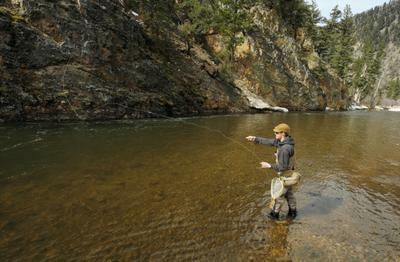 Hard to cozy up to trout fishing in the Hills with attitudes like that, but we manage. I'm way too lazy to prep mole skins when you can pick up a tanned pelt for under three bucks. I've probably only used a square inch of the stuff and I gave a bunch of fluff to friends. I feel like I learned better when a friend dropped off a mallard for plucking. I got one pair of medium sized bronze feathers, and a few bags of less useful feathers. It took forever to sort and clean everything. I will still scavenge for materials I can't buy. I found a beautiful roadkill bird (that shall remain nameless) this winter that was worth the effort. Other than that, I'll leave the material prep to the pros. Rock Creek was mudding up quick the day we left. I'm not surprised that it's chocolate milk right now. It's been warm and rainy. I haven't fished the Boulder (that one at least) yet. The climbing at Natural Bridge is great and my friend kayaked it in flood conditions (sounded terrifying), but that's it. I might need to make a hybrid fish and rock trip.